They say there is no such thing as a free horse which in away is true. I paid nothing for this little bay paint mare, but I gained a whole lot when I added her to my program. 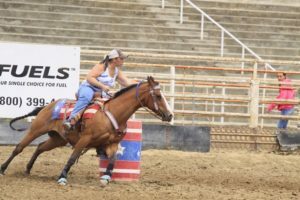 I am a barrel racer and have never really done gymkhana. Last Fall we a did a clinic with a few ladies from TCR (Tri-County Riders) and played around on Windy, but didn’t really think much of it. Then in November, one of my students attended a TCR show without me and have a great time. I attended their awards banquet last December and decided this was a group of people I wanted my students and myself to be around. This year my student continued to show at the gymkhanas and I would go to help her in her runs. In February, a friend called me with a proposition. 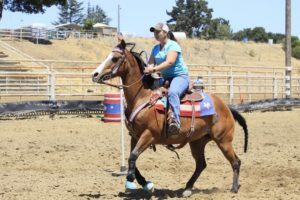 She had a little mare she needed to find a home for, that she felt would be perfect for my program and for me to compete on while I bring up my “younger” crew. So she dropped Snick off February 15th. 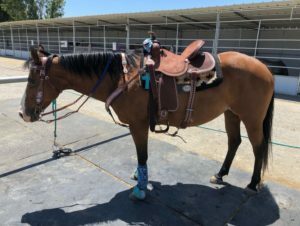 I have been using Snick in my lesson program and riding her myself.I showed her in April and we did good for our first gymkhana show together. The girls play around on the patterns with her and we all have a good time. The opportunity arose for me to compete at TCR’s Firecracker Frenzy, all I have to do was pay for my stall for the 3 nights. So, we entered 12 of the 13 events several of which I had never done. The adrenaline was rushing as I had really been in the arena like that since 2016. I was nervous and didn’t really ride my horse the way I know how the first day. Day 2 was better, but day 3 was when we really shined! I ran a 20.9 n the barrel pattern with so much room for improvement and I have been bitten by the gymkhana bug! We finished our weekend off placing 15th in our division of FC 12-34. I can’t wait for the next horse show and I can’t wait to get going on the rest of my herd to show them too! I went to a gymkhana on my blue roan horse onetime when he was just coming back from an injury. He was still fresh, but I place in every event, and at the end of the day won high point. I won a really nice “blingy” halter as well as a matching breast collar. It was fun! Just another comment, my best barrel horse Harold (who is now 33 years old) was given to me when he was 10 years old. He was 2nd level dressage and had run on the racetrack. I made a barrel horse out of him and he won thousands of dollars for me before I retired him! 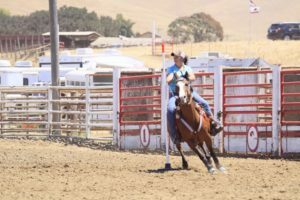 Copyright © 2017 SL Barrel Horses. All rights reserved.